​New clients receive $50 off your first visit! Ne​w​ puppy owners join us for puppy preschool classes. ​​Paw wellness programs. yearly plan for your pet. ​Never miss a treatment again. We'll post them when they are due. 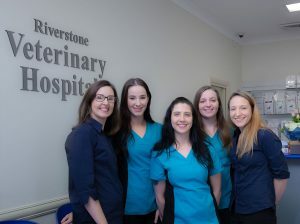 Riverstone Veterinary Hospital offers a unique standard of excellence in veterinary services. We pride ourselves on breaking down the barriers to good quality vet care by taking the time to teach, explain and guide you, allowing you to making the best possible decisions for your pets health, at a budget that suits you. We take time to care…. To care for both you and your four legged family members. We are not just vets. We are wanting to be part of your pets life. Erin, thank you for everything you have done for our boy Hercules. You are seriously the best vet anyone could ever ask for, you always have gone above and beyond what we had ever expected and so honest in your opinion. We are forever grateful to you and feel so lucky to have found you. Thank you for being my boys’ second mum!! “Without the never ending commitment of my two wonderful vets, Erin and Prue, my two beautiful dogs would not be with us today! Three years of total endless devotion they have kept my little ones alive. There’s not enough words to describe how much we owe you both. Dr Erin and Dr Prue have been caring for my dogs for 4 years now, and as an ex-vet nurse, I highly recommend their professional expertise, and their genuine love of animals is second to none. As a small team of experienced dog owners and lovers, we really get to know you and your dog and we can guarantee consistent and personal care that is equal to your love and attention.